ho ho yum yum, I'm one of those people who will put salt on top but regardless this looks amazing! Congratulations on finally cracking the popcorn/dessert barrier! You are a vile temptress. Haha oh yummo! 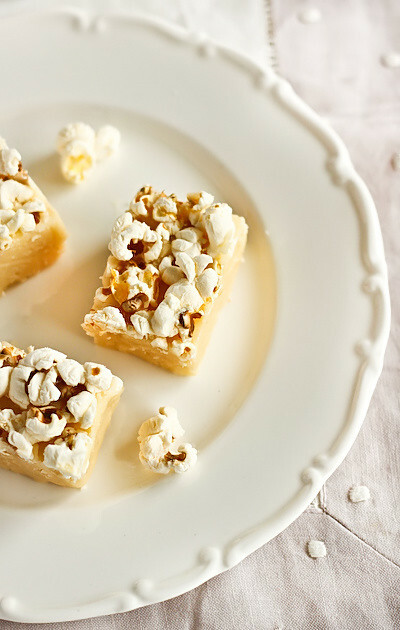 Yeah popcorn desserts are 'popping' up everywhere hey? =D My boy loved Zumbo's popcorn macarons and has wanted me to make something popcorny for ages but I just havn't got around to it yet. And hey, don't mock the microwave popcorn! They're good for crazy popcorn cravings in the office! What a fantastic and fun idea! A great companion to a movie marathon evening. This looks great! I might make kettle corn and put that on top for some salty sweetness. 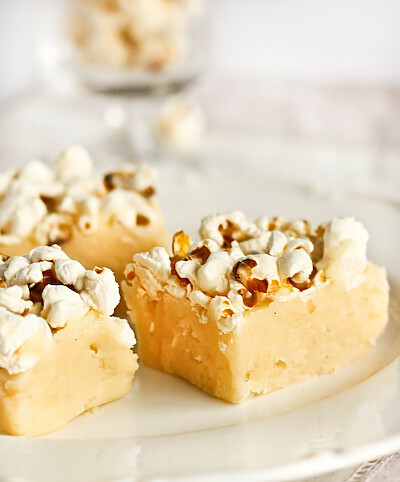 omg your popcorn fudge looks awesome! haha and I love the birthday lasagna too hehe happy birthday A! sooo yum!! I retweeted bc this is brilliant! Such a cute idea. Popcorn anything is guaranteed delicious, I say. Surely it has nothing to do with the lashings of butter! 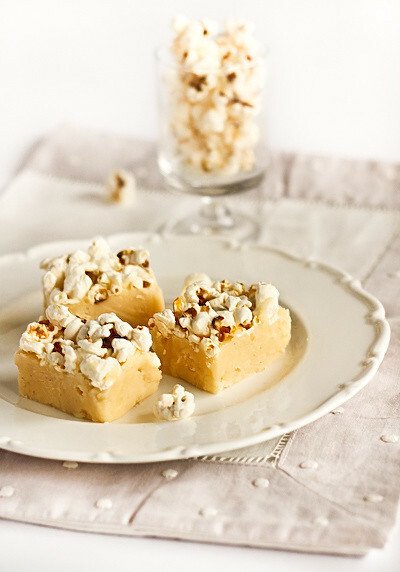 OMG, I love fudge but you took it to the next level with the popcorn. I'm sure the popcorn compliments the sweetness of the corn. Sweet and salty...that does make sense! You are so creative! That looks SO GOOD. Mmmm popcorny fudginess. i don't know you.. but i am proud of you. lol. Next time you should make lasagne out of fudge. Or fudge out of lasagne. Either way, feminism wins. I'm not a big fudge fan myself, but I know I could definitely chow down on some of this fudge! 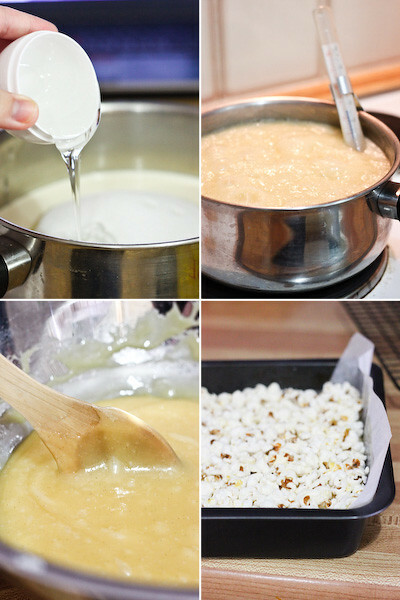 What an awesome idea to add the popcorn! Love it! Woah! that looks really yummy!! 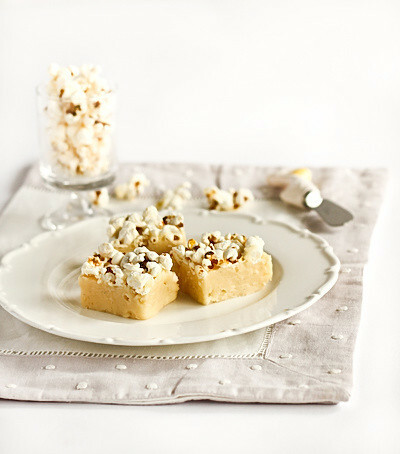 I always found that fudge was a little too heavy but with the addition of popcorn I think that would really add an element of texture to it! well done! Anonymous - So sorry, I never know what to put for the cream part because each country uses different terms. By pouring cream I'm referring to what Australian's call 'Pure cream' - 35–56% fat, without artificial thickeners, not canned. What a great combination! My weekend project! WOWWY! 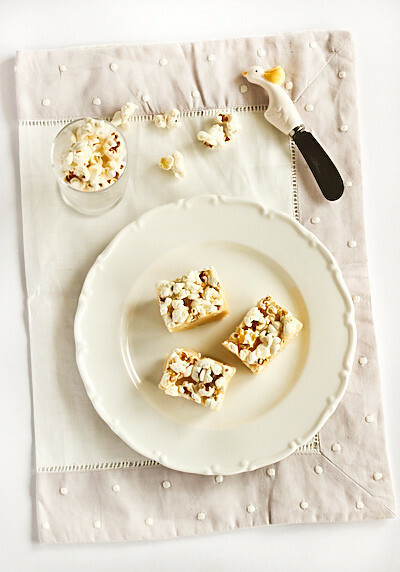 You have hit on popcorn and fudge genius. I have bookmarked the page. oh, and I prefer vanilla fudge to choc as well!! O.M.G. this looks soo yummy! Hey, i'm so excited to make this! But I was just wondering, why do you put the butter in the bowl and then pour the fudge on? What's the point? Thanks, I'm so in love with your blog! Anonymous - You'd have to ask Martha Stewart exactly why, but I'd guess it's just because it's the last ingredient that needs to be added i.e. it can't be mixed in while heating the sugar syrup or it might not set properly? All I know is that it worked for me! Recipe looks great. Quick question but what is pouring cream? Is that like whipping cream or heavy whipping cream? Anonymous - Pouring cream in Australia is min. 35% milk fat unthickened pure cream, which I'm fairly sure would be heavy whipping cream for you.